I ordered some half yard solids from Connecting Threads to give them a try. I really like the look and feel of the fabric so far. Cherry ~ The color is too orange for me. Red ~ It's what I was hoping for it to be. Not too dark. A nice bright red. Parchment ~ It has a slight grayish tint to it. I was hoping it wold be more along the lines of Kona Cotton snow. Silver ~ This is a wonderful shade of light gray. I have been looking for a light gray for a long time. I will order it again. Blush ~ A very nice soft baby pink. Not a peachy pink. Kiwi ~ It's easy on the eyes. The green is not too lime nor too olive colored. It goes well with the other fabrics in my stash. I, too, love Connecting Threads. I've never been disappointed in any fabric or thread I've ordered from them. They have great sales as well. What wonderful colors...I too like connecting threads. I really like that Kiwi too! I have been using their white for a while now. Can't always afford the Kona. I have been pleased with it. Thanks for the run down of the colors nice to know. I have been impressed with the quality of Connecting Threads! I ordered a fat quarter collection of their Classic Dots Sampler and love them all! They make me smile every time I look at them! Thanks for the run down on the colors, it's always better to hear someone else's opinion when you are dithering over a decision. I'm wondering how these solids compare to Kona solids. I have some color spaces to fill in and always love high quality white. Amy: What a great variety of solids. Thanks for sharing your insights. I too had looked and looked at their solid fabrics but hadn't ordered any. Great to know that you liked the feel and weight of the solids! nice stash enhancement. I don't have many solids either...hmmmmmm you got me thinking.......LOL do we really need an excuse to buy fabric? I think not. Thank you for the tips on this, Amy. I'm definitely going to check them out. 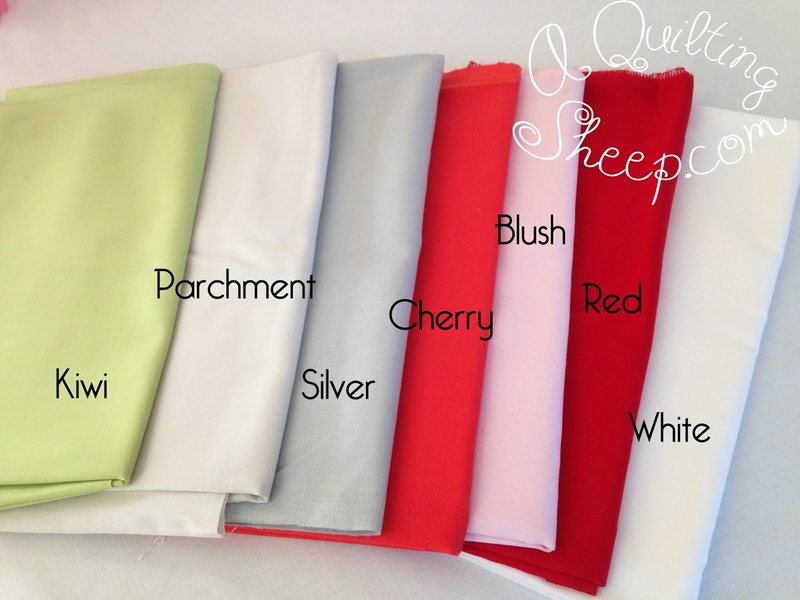 Just ordered a bunch of Moda White Cotton from Fat Quarter shop. Did you like the quality of these fabrics? How do they compare to the Kona Cottons? I love Connecting Threads. Even if you don't like the affordable fabric lines, they have some of the best prices on quilt books I have ever seen!